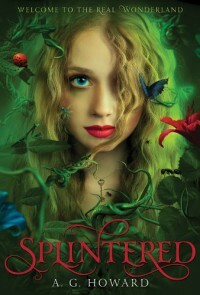 This book is amazing, it has a nice twist on the Alice in Wonderland story. The main character is Alyssa. Her mother is in the insane asylum because she can hear bugs and flowers talking well so can Alyssa because that's their family secret. They are descendants and Alice Lendell. Alyssa expresses this through her bug mosaics of dreams she has of wonderland but they are more like memories to her, because when she was little she had a netherling friend named Morpheus that only visited her in her dreams and taught her about wonderland and the netherling creatures that live there. Well as she grew older he visited her less and less until she forgot about him completely. Then her best friends arive Jeb and Jen. On prom night Jeb has a fight with his girlfriend and goes to Alyssa's house and see's her going through the mirror to get to the rabbit hole so she can save wonderland. They go on this crazy adventure and she finally gets to meets Morpheus.